The only thing to fear is the lack of fear itself. Benjamin Graham, the guru on investment often cited by Warren Buffett, referred to Mr Market, a personage characterised by wild mood swings. His moments of euphoria may be more enjoyable than those of despair. But they are dangerous. Over-optimism is the natural precursor of excessive risk-taking, asset price bubbles and then financial and economic crises. The turbulence seen last week was exactly what was needed. It is a pity it did not happen far earlier. But fear has returned. Hurrah. So far, as Gavyn Davies notes, this has been a minor event. On the evening of February 12, the market was only 7.5 per cent below its most recent all-time high. The cyclically adjusted price/earnings ratio, a measure of long-term equity valuation developed by Yale’s Robert Shiller, is still higher than in any previous period, except 1929, and again between 1998 and 2001. The sudden jump in volatility may be disturbing, but it is both natural and useful: it should help puncture complacency. Mr Davies suggests that US employment data for January, which indicated a small rise in wage inflation, were the trigger for the market correction. Yet this jump was very small. So, too, is the recent rise in the spread between conventional and index-linked US bonds, which indicates expected inflation. At present, the corrections we are seeing in equity and bond markets are modest. Could it get far worse? Definitely, yes. First, by historical standards equities and bonds are, respectively, expensive or astonishingly expensive. The high prices of bonds are the mirror image of both very low real interest rates (still below 1 per cent in the US) and low expected inflation. The US 30-year conventional bond still yields a mere 3.1 per cent. Italy’s 30-year bond yields much the same, while Germany’s yield 1.4 per cent. It takes no imagination to visualise these yields jumping massively. Second, clear indications of financial fragility surround us, of which the most important is rising indebtedness. In the third quarter of 2017, the stock of global debt was 318 per cent of gross output, up from 280 per cent at the end of 2007. Largely as a result of the financial crisis, government debt jumped from 58 per cent of world output to 87 per cent. Possibly more significantly, gross debt of the non-financial corporate sector rose from 77 per cent to 92 per cent of global output. At the same time, household indebtedness has only risen from 58 to 59 per cent of world output. But, significantly and surely encouragingly, financial sector debt has fallen, from 87 to 80 per cent of output. Third, a strong synchronised global economic recovery is under way, with unemployment in a number of important economies reaching low levels: the US rate was down to 4.1 per cent last December. In this context, an unexpectedly rapid increase in nominal (and real) wages and consumer price inflation would hardly be surprising. That could force a rapid tightening of monetary policy, not just in the US. Furthermore, the US has just initiated a grossly pro-cyclical and fiscally irresponsible increase in its structural fiscal deficit, one designed, overwhelmingly, to shower benefits on the wealthy. The hypocrisy of this, in view of past Republican assaults on attempts by the Obama administration to administer a desperately needed fiscal boost to the crisis-hit US economy in 2009, is breathtaking. It would not be surprising if this fiscal policy, along with a worldwide recovery in private investment, raised real interest rates across the world economy. Finally, the world confronts significant uncertainties. That is inevitable, so long as someone as unstable as Donald Trump remains in charge of its most important country: war, trade war or some other unexpected shock could destabilise the current expansion. Given all this, it is easy to understand those who worry about big falls in asset prices ahead. Would that also trigger a huge financial crisis? Some fear it might. There are, however, reasons for being more optimistic. One is the deleveraging of the financial sector. Another is the hope that those who manage systemically significant financial institutions remain scarred by the crisis and are managing risks more prudently than before. Another is the tightening of regulation, which has not gone into reverse, yet. Finally, one of the beneficial consequences of much-despised quantitative easing is that banks are far more liquid than ever before. Yet none of this removes the fundamental facts that a great deal of leverage is embedded in the financial system and banks, above all, remain highly leveraged businesses. A still more plausible danger is that a big fall in asset prices would cripple demand at a time when the room for offsetting policy manoeuvre is still relatively limited. This might then be the occasion for truly unconventional policies, possibly including direct monetary financing of government spending. Many argue that such risks show the lack of wisdom of past policies. Indeed, policymakers relied too much on central banks and too little on fiscal policies, in order to escape from the Great Recession. It would also have been wise to deleverage far more aggressively. Yet those who argue that it would have been better for central banks to have left the economy in recession than undertake aggressive monetary policies are utterly mistaken. It is immoral and ultimately impossible to sacrifice the welfare of the bulk of the people in order to placate the gods of the financial markets. If a policy designed to stabilise our economies destabilises finance, the answer has to be even more radical reform of the latter. The role of Mr Market is to support the economy, not endanger it. We must never forget this. For 15 months, from the 2016 election of President Donald Trump until recently, the stock market was a smooth, one-way trade: up 34%, with nary a significant pullback. A turn on the Brooklyn Cyclone it was not. That beautiful ride is now over. A fast and vertiginous drop in February points to a material change in investor psychology, to cautious from enthusiastic. Where previously rising interest rates were acceptable because of strong global growth, now investors are focused on the potential inflationary threat from such growth. The underlying concern is that rising prices could cause the Federal Reserve to tighten monetary policy faster than the market is anticipating. There is also a new unknown factor: Fed chair Jerome Powell, who was sworn in Feb. 5. The road ahead isn’t yet clear, and there are reasons to think the bull can continue to run. This time, however, trading is expected to be choppier, and investors more nervous than they have been for two years. 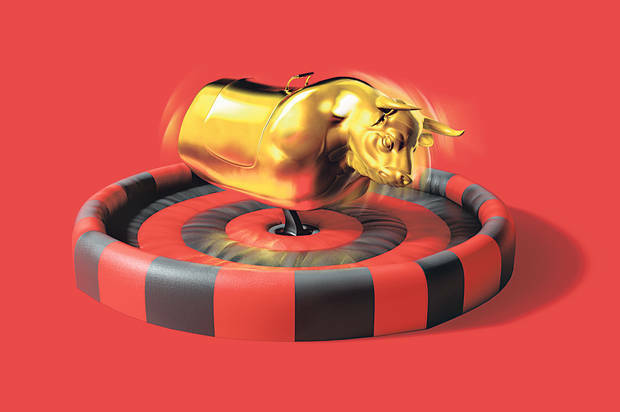 “It will be a tug of war,” says Keith Lerner, the chief market strategist at SunTrust Advisory Services, “a battle between fear and greed…Those who missed out want to get in, but those sitting on gains will want to sell,” he says. With February’s swift stock market correction, volatility has arrived and will probably stay awhile. 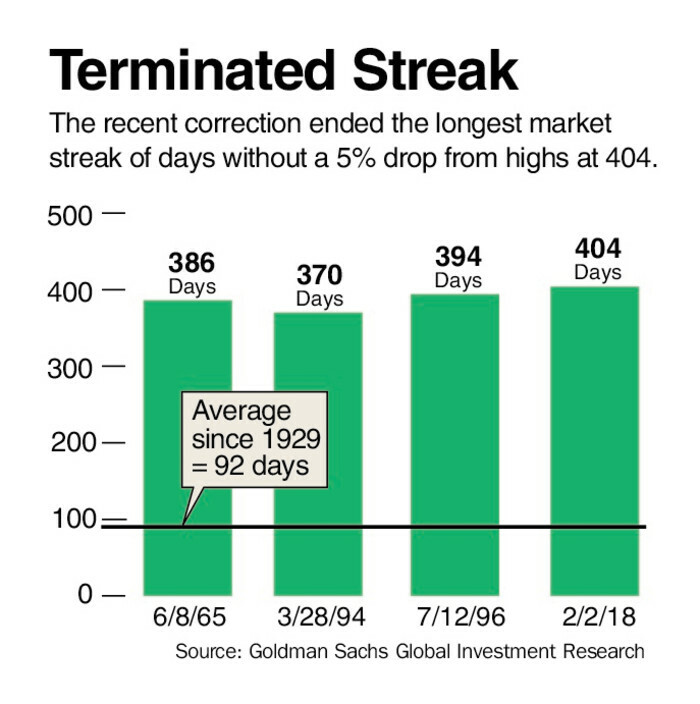 The downturn last week ended a streak of 404 trading days without a 5% drop in stock prices from the previous high—the longest such streak in market history. The last correction came in February 2016, when stocks dropped 15%. Investors then fretted that Chinese economic growth might be slowing, which turned out to be a false alarm. Long term, the latest nose dive might yet become just a bull speed bump, but there’s already been plenty of pain. The Standard & Poor’s 500 index closed on Friday at 2619.55, rallying 1.5% on the day, but down 5.2% for the week. At Thursday’s close, stocks were down more than 10% from their previous all-time high—the traditional definition of a correction—of 2873, set Jan. 26. Down 2% the market is already below the previous year end—a position it was never in during 2017. The index briefly broke below its 200-day moving average on Friday, a negative sign, but immediately bounced higher and managed to close above the moving average. Does this mean a bear is in sight after nearly a decade in hibernation? Bear markets, a 20% drop from the highs, are typically caused by recessions. Yet anxiety about further losses has intensified, despite little evidence of any economic contraction in the offing. An upturn in stock market participation by individual investors—typically latecomers in a bull market—also concerns some veteran market watchers. And some think that the market is in the process of altering its view on the relative merits of stocks versus bonds. The stock plunge is the symptom and the disease is that there’s been a fundamental sentiment shift about rising rates, says Michael O’Rourke, the chief market strategist at Jones Trading. “For years, people have said stocks are cheaper than bonds, but now yields are going higher,” he says. “Bonds are getting cheaper and will compete with stocks.” (Bond prices move inversely to yields.) The key metric that stocks are cheaper than bonds will reprice, O’Rourke predicts. 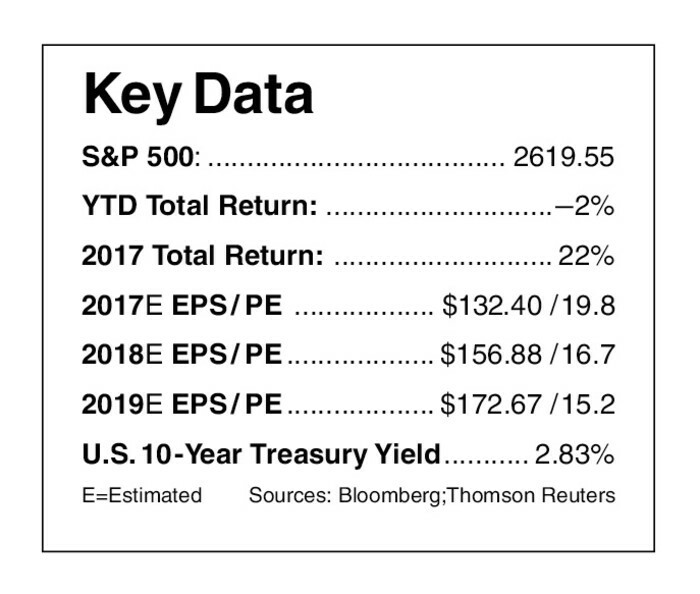 On Friday, yields on the U.S. 10-year Treasury note finished at 2.83%, significantly higher than the 2.41% at year-end 2017. That yield surge in such a short period of time was faster than the stock market could handle, Nuveen’s Doll says. On Feb. 2, when the stock market correction began, the spark was news from the Department of Labor that January’s hourly wage rise was 2.9%, the biggest year-over-year rise since June 2009, when the last recession ended. That released the market’s inflation demons. As yields approached 3% that day, a level not seen since 2014, “investors took that 2.9% wage number and ran with it,” Cecilia of Bryn Mawr Trust says. As the market was being whipsawed, the Fed—heretofore seen as supporting riskier assets like stocks with former chair Janet Yellen’s accommodative stance for years—has abruptly become something of a question mark. Powell’s tenure began on the worst day of the correction so far. Markets aren’t familiar enough with him yet, though he’s been a Fed governor since May 2012. THE MARKET IS TESTING the new chair, says Lerner of SunTrust. “People think he will continue Yellen’s gradual rise in rate policy, and this market drop suggests he will have to,” he says. While Powell himself hasn’t commented yet, and perhaps won’t do so early on, other Fed officials last week did reiterate the central bank’s plan of raising rates gradually. Investors expect the Fed to increase the federal-funds rate by three moves of 0.25 percentage point, to 2.00 to 2.25% by year end. On Tuesday, James Bullard, the president of the St. Louis Fed and a member of the Federal Open Market Committee, said he didn’t think the strong U.S. labor market meant higher inflation was imminent. As it stands, sentiment weakness is unlikely to kill the bull market, but it is a less favorable environment for equities short-term. If you had to pick the time when the market’s attitude changed, it would probably be when the Dow Jones Industrial Average gapped down some 800 points in the matter of about 10 minutes midafternoon last Monday. At one point, the Dow was down nearly 1,600 points, the largest intraday point drop in history. You could almost hear the gasp on Wall Street. While much of the plunge was blamed on automated and machine trading, not all of it was. Once arguably too complacent about inflation, investors are now clearly affected by growing uncertainty about rising bond yields. With investors so troubled by one number—the unexpectedly high 2.9% wage rise—it’s likely that each inflation-related data release from here on could be a potential flash point for another bout of turbulence, if the data indicate inflation is rising fast. The next one could be the report on January consumer prices, which comes out on Wednesday. Investors should get used to more volatility than has been the case for a long time. The stock market decline is more a function of the sharp 7% January rise—at one point—than anything else, he adds. The drop smacked of a lack of rationality, where selling begets selling, he says. Tom Elliott, international investment strategist for deVere Group, calls the yield rise an overreaction to inflation data. “Herd mentality had stocks overreacting too—and ignoring the contradictions,” he says. Stronger economic growth (implied by the wage rise) is good for earnings, and equities—unlike bonds—are a hedge against inflation. 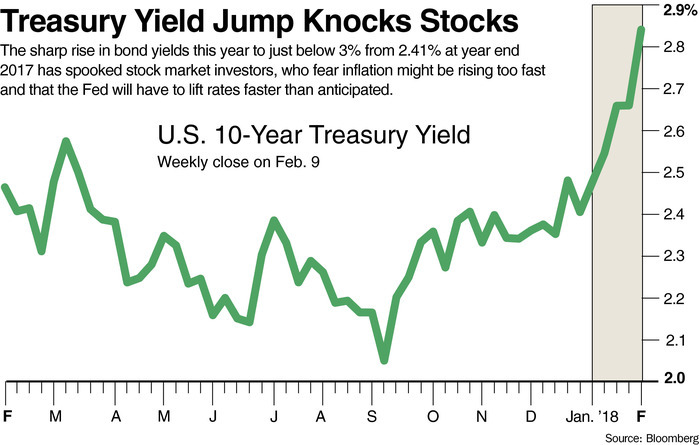 “If you believe that bond yields are rising on inflation, that’s when you run to stocks,” he says. Indeed, there are powerful fundamentals driving the bull higher. Stronger global synchronized economic growth along with the weaker dollar should help drive profits at many of the companies in the S&P 500. Last month, for example, the International Monetary Fund raised its estimate for global growth to 3.9% from 3.7%. Earnings per share—even before the recent tax changes—have risen at rates not seen for years. If there is a silver lining to this correction, it is that stocks are much cheaper than they were just a few days ago. The S&P 500 index’s valuation has dropped sharply. S&P 500 earnings per share are expected to jump 17% in 2018, to $156.88 from an estimated $132.40 last year. In 2019, a further 10% rise to $172.67 is anticipated by analysts. 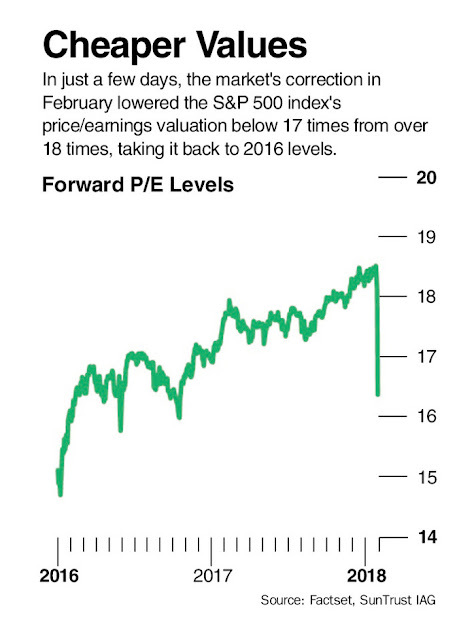 Consequently, the market’s price/earnings ratio has dropped to 16.7 times forward earnings—the lowest since one year ago—from 18.8 times at January’s high. Nuveen’s Doll expects the market P/E to be lower on Dec. 31 than it was on Jan. 1, which would be the first time in six years that the P/E declined in the course of the year, he adds. He looks for the S&P 500 index to finish around 2800 this year, for a total return of 6% to 7% when all is said and done. Some bullish strategists suggest the correction is actually a positive long-term development for the bull market. “It isn’t the beginning of the end, but a normal correction in a long upward move,” opines Chris Gaffney, president of world markets at EverBank. Rates are low, global growth is good, and earnings are better than expected, says Gaffney, who expects a choppy market with an upward bias. Interest rates are the biggest risk, but the Fed will raise gradually and a 3% yield on the 10-year Treasury isn’t the end of the world for stocks, though it could pressure dividend shares, he says. WHAT MATTERS, says another bull, Jim McDonald, chief investment strategist at Northern Trust, isn’t the number of rate increases but the environment when they are raised. There have been instances in the past when a bull market didn’t blink at a Fed rate increase of three percentage points and another that was brought down by the same amount of hikes. Moreover, he adds, mini-meltdowns like the one seen last week “will help extend the bull cycle,” he says. It restrains the stock market euphoria, something the Fed is likely to have concerns about, he adds. McDonald isn’t fazed by the 2.9% wage number: “You need to see wage gains above 4% to see an impact on inflation.” There’s been a lot of media attention given to the wage boosts and bonuses seen at some big U.S. companies, but “we are making a bet that in general managements haven’t lost their cost discipline,” he says. While market bulls remain uncowed in their enthusiasm, they also acknowledge the market wounds aren’t superficial, and that volatility isn’t going away soon. Bear markets are typically born of recessions and the evidence for that is slim, they say. The caveat to the bullish view is, unsurprisingly, inflation. Jason Pride, director of investment strategy at Glenmede, says that if the Fed were to increase rates four or five times this year, instead of the expected three, it would pressure stock values. And exogenous geopolitical events could take on added meaning in the current environment, Pride says. And here’s an interesting twist. A look at the CME Fed futures market shows that market’s view of a third rate increase in December has dropped to a 44% probability on Friday from nearly 58% on Jan. 26, the day the market hit its all-time high, according to Bloomberg. Fed futures have had a good track record of correctly predicting Fed rate changes over the past few years. The stock market’s selloff makes a third rate hike less certain, given the tightening in financial conditions from lower stock prices and higher bond yields. Caveats are more important when the market’s valuation isn’t cheap on a historical basis, as is the case now. The higher the valuation, the lower the bar for risks and uncertainty that could elicit a market reaction. Before Feb. 2, few observers would have predicted a monthly wage increase would be the instigator of a correction. INVESTOR WORRIES about inflation and yields are the paramount issues, but the destruction of investor complacency caused by February’s plunge might allow other back-burner issues—like the U.S. midterm elections in November or Chinese economic growth—to be viewed as more worrisome than they had been previously. 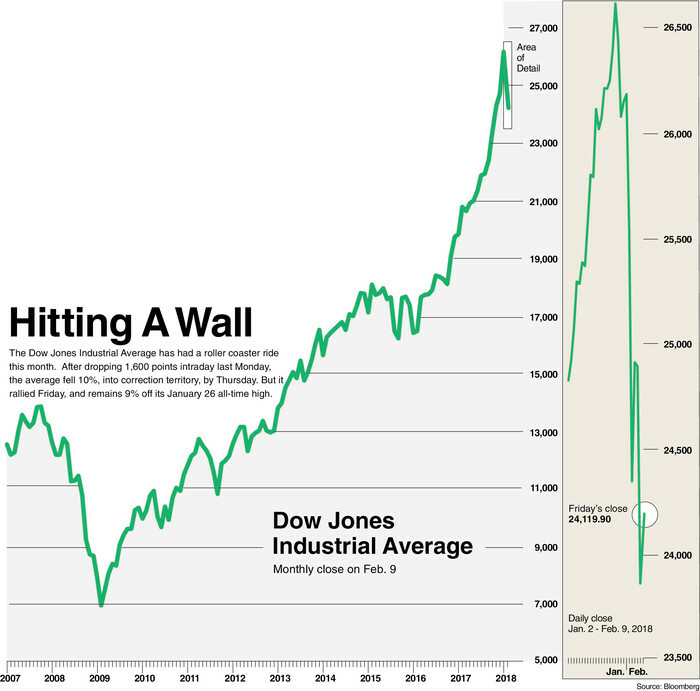 Ned Davis, senior investment strategist at Ned Davis Research Group, contends that when you get parabolic rises in stock prices—as in January—the market cracks can form more quickly. Easy monetary policy makes overvalued markets manageable. But when the Fed starts raising rates it can start to bite. Whether the next rally makes a new high or not is “very important,” Davis adds. Previous to the correction, what was a positive development for Main Street—rising wages, low inflation, falling unemployment—was also promising for Wall Street. It meant, for example, that consumers enjoyed increasing income and with that a rising capacity to buy more of the things that Corporate America produced. The turbulent reaction in the market, however, suggests the convergence of interests will be tested regularly this year. “What might be good for Main Street, might not be good for Wall Street—if the Federal Reserve ends up tightening more quickly than investors expect,” SunTrust’s Lerner says. One thing is clear: Interest rates are going up, not just in the U.S. but around the world. Although investors were well aware of this for over 12 months, it began to hurt only recently. From here on in, it is likely to become a bumpier market, with pockets of downdrafts—perhaps like the one that kicked off this month, perhaps even worse—before the bull resumes. The threat of a bear market remains relatively low, but the one-way ride is over. In 2018, the global economy is more interconnected and interdependent than ever before. The nature of international trade means that decisions made by governments and businesses in one country can have a deep and lasting impact on workers and high streets half a world away. Any government that is serious about the economic prosperity and security of its people and businesses must have an international outlook, and must be prepared to reach out around the world and secure agreements abroad that ensure jobs and prosperity at home. For a global trading nation like the UK it is doubly important, which is why I am travelling to China at a crucial moment in the history of both our countries. As China opens up to the world, its fast-growing economy is already helping British businesses. It is creating new markets for a vast range of products, from milk to motorcycles to the latest innovative technology. It is turning the spotlight on new partners that British innovators can work with to develop ideas and bring them to market. And it is delivering a new source of capital that — with the appropriate safeguards in place — can help us to invest in the future of our country. Together, that means a stronger British economy and more and better jobs for British workers. In his address to last year’s Communist party congress, President Xi Jinping pledged to open up his country still further. On the back of 40 years of double-digit growth, China is now moving to a new focus on sustainable long-term economic development. The sheer economic weight of China means that the way in which this happens will have a huge role in shaping the future of the world in which we live. I want that future to work for Britain, which is why, during my visit, I will be deepening co-operation with China on the key global and economic issues that are critical to our businesses, to our people and to what the UK stands for. Our relationship with China shows what such co-operation can bring about. As early supporters of the Asian Infrastructure Investment Bank, we have been able to play a central part in ensuring it follows international best practice. This will help the bank deliver major regional infrastructure projects that provide real economic benefit for people across Asia — and, in turn, for British business. These significant commercial opportunities will only grow. The UK and China will not always see eye-to-eye. But as partners committed to global free trade we can work together to confront and tackle challenges that affect all of our economies. So we will continue to look at what more can be done to tackle global overcapacity in sectors such as steel, and to ensure that, as our companies innovate and develop new products, they are confident that their intellectual property and rights will be fully protected. We also need to protect the rules-based approach that underpins and enables robust, sustainable, free-flowing global trade. As we have long argued, all large economies have a special responsibility to show leadership on this front, demonstrating that we respect the rule book and collaboration through the World Trade Organization as we seek to open markets and embrace new opportunities. Issues such as overcapacity, intellectual property and trade rules have a direct impact on the livelihoods of British workers and their counterparts around the world. And — just as with global challenges from international terrorism to modern slavery — they are best tackled not through unilateral action but global dialogue and co-operation. I want to step up our relationship with China as it opens up its markets, spreads its prosperity and embraces free trade. And I want to see that this happens in a way that protects our values, ensures global security, and advances the multilateral system for which we have fought so hard. That agenda will not be delivered in one visit; it must be our shared objective over the coming years. But I am confident that, as China continues to open up, co-operation and engagement will ensure its growing role on the global stage delivers not just for China, but for the UK and the wider world. 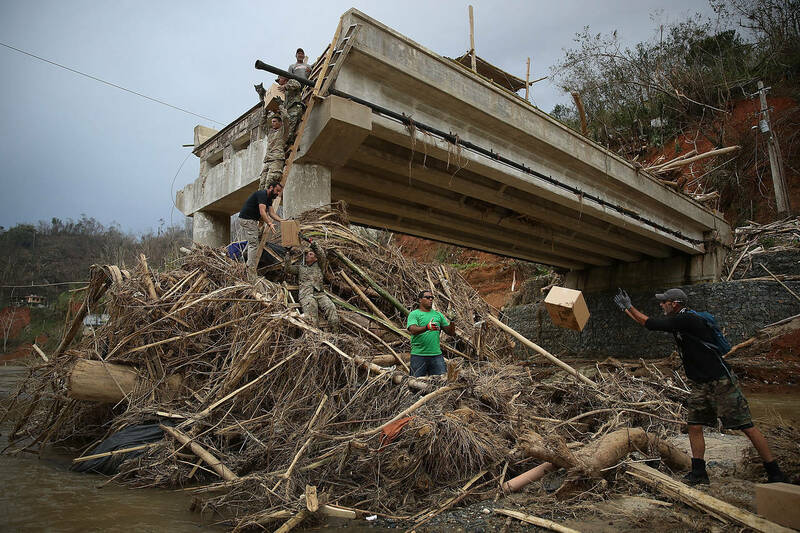 Harry Markowitz, a Nobel Prize winner and the father of modern portfolio theory, has invested 100% of his liquid assets in the stock market, betting that the destruction from last year’s hurricanes will bolster industries involved in the reconstruction. Now 90, Markowitz won the Nobel in 1990 for his theory of “portfolio choice,” which holds that investors can allocate their money, even amid uncertainty, to maximize their expected return based on how much risk they are comfortable taking. Developed in the 1950s, the theory demonstrates the utility of diversification—that a portfolio’s different constituent assets will be less correlated with each other, thus preserving return but with lower overall risk. He is working on the next two volumes of a four-part series called Risk-Return Analysis, subtitled The Theory and Practice of Rational Investing. “And that’s a lie,” he adds. “It’s really rational decision-making”—examining what we know, how we know it, and how it relates to action under uncertainty. The fourth volume will consider how things interact with each other in a chain of reactions. Which is what got him thinking about the hurricanes. “My knowledge is inference and action,” he says. “I never did a study of the construction industry, but I know there’s walls there, and glass there, and if you want to get rid of rubble,” you will need the right equipment, he says. Markowitz put one third of his liquid assets into large-cap stocks, one third into an iShares fund tracking small-caps, and one third into an iShares fund tracking emerging markets. But that wasn’t quite right. “Then I said no, no, no, let’s take the one-third big cap and split it equally among six equities,” he says. He picked Weyerhaeuser (ticker: WY) to represent the lumber that would be needed, USG (USG) for the wallboards, Corning (GLW) for the glass, Caterpillar (CAT) because “think of how many bulldozers they’re going to need all over Puerto Rico,” 3M (MMM) “for who knows what, replacing all the Scotch tape of the world, and mining, of course,” and, finally, United Technologies (UTX), which manufactures and maintains air conditioners and Otis elevators. Markowitz usually prefers diversifying with passive investments. But he doesn’t think he is too heavily concentrated. He points to his two index-tracking funds and his fixed assets in the form of two houses, one to live in and one for entertaining. Markowitz may have the same information as everybody else, but he sees things differently: Even as news articles forecast that the stock market was getting too high and had to have a correction, Markowitz didn’t see it as out of line with the economy at all, especially when combined with the benefits of tax cuts and corporations repatriating money they’d kept overseas. For now, though, he teaches at the University of California, San Diego, and says that he has about a dozen clients with whom he consults, including GuidedChoice, a 401(k) advisory, and Research Affiliates, which sells smart-beta funds. He recently signed on as a research advisor to LongTail Alpha, a hedge fund run by a former Pimco quant, Vineer Bhansali, which focuses on protecting against low-probability outcomes—that is, guarding against the unexpected. After meeting at a conference, they went to lunch the day before Thanksgiving at Markowitz’s office, and Markowitz mentioned his current equity allocation. Bhansali was struck that “the person who basically invented diversification as we know it” was “not very diversified”—and he’s been right. Bhansali wondered if volatility had to rise, or if they’d entered a world with permanently low yields and low volatility. “How would we know when the markets were ready to turn south?” he asked the economist. Markowitz responded by asking if Bhansali had seen the Road Runner cartoons. “You know how Wile E. Coyote chases Road Runner off the cliff and then finds himself hanging in space momentarily defying gravity before plummeting into the abyss,” Markowitz said. In other words, we’ll know when we look down. For now, at least, Markowitz sees firm ground. A DECADE has passed since Larry Diamond, a political scientist at Stanford University, put forward the idea of a global “democratic recession”. 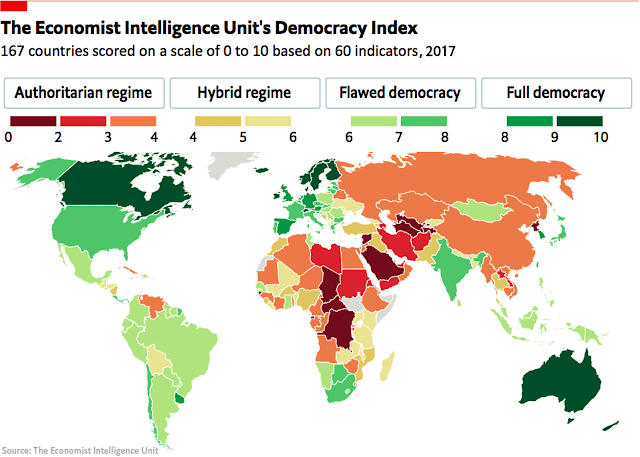 The tenth edition of the Economist Intelligence Unit’s Democracy Index suggests that this unwelcome trend remains firmly in place. The index, which comprises 60 indicators across five broad categories—electoral process and pluralism, functioning of government, political participation, democratic political culture and civil liberties—concludes that less than 5% of the world’s population currently lives in a “full democracy”. Nearly a third live under authoritarian rule, with a large share of those in China. Overall, 89 of the 167 countries assessed in 2017 received lower scores than they had the year before. Norway remains the most democratic country in the ranking, a position it has held since 2010, and western Europe accounts for 14 of the 19 “full democracies” that make up the ranking’s top tier. Nonetheless, the region’s average score slipped slightly in 2017, to an average of 8.38 points out of 10. The Spanish government’s attempt to stop Catalonia’s independence referendum by force on October 1st caused the country’s score to fall by 0.22 points, leaving it just 0.08 points above the “flawed democracy” threshold. In Malta, the unresolved murder of Daphne Caruana Galizia, an anti-corruption blogger, raised questions about the rule of law and the authorities’ willingness to investigate sensitive crimes, leading to a drop of 0.24 points. And France, already a “flawed democracy” according to the taxonomy of the index, fell further down the table, even though its voters firmly rejected a far-right candidate in a presidential election last year. The country’s civil-liberties score declined because its legislature passed a law expanding the government’s emergency powers. The star performer in the 2017 rankings is the Gambia. After 22 years of rule by Yahya Jammeh, a dictator who suppressed political freedoms, centralised powers within his ethnic group and used the army to instil fear, the country enjoyed its first-ever democratic transfer of power last year. As a result, its democracy score improved from 2.91, classified as an “authoritarian regime”, to 4.06, a “hybrid regime” 30 places higher in the rankings. Conversely, the most notable declines occurred in Indonesia, which fell from 48th place to 68th, and Venezuela, whose score dropped into the “authoritarian regime” category. America sits in 21st place in the ranking, level with Italy. It remains a “flawed democracy” for the second year in a row. That’s the estimate for how many “ghost accounts” were created by banking giant Wells Fargo. That’s about 1% of the total U.S. population. It’s also roughly the population of the state of Connecticut. Wells Fargo created millions of fake accounts for its customers… to charge them fees for services that they never requested. It was later discovered that Wells Fargo was signing customers up for unwanted insurance policies as well – again, to charge customers for services that they never requested. This was outright fraud. It’s for reasons like this that a new type of technology has burst onto the scene. It enables secure, reliable, and transparent transactions… without the potential for manipulation by big financial institutions. As an investor, this technology needs to be on your radar. Recently, I wrote to you to give you an “inside look” at the world of cryptocurrencies. I told you that the crypto market would experience some pullbacks and high volatility. We’re seeing that today. Bitcoin, the world’s first cryptocurrency, dropped about 30% earlier this month. But despite these pullbacks, I’ve also told you that these new crypto assets still have a long way to run in the years ahead. And the reason why can be summed up in one word: blockchain. You’ve likely heard the term “blockchain” associated with the popular cryptocurrency Bitcoin. You may even know it as the decentralized ledger technology underpinning cryptocurrencies. Blockchain technology is also known as distributed ledger technology. We can think of a distributed ledger in its simplest form as a distributed database – distributed in the sense that there are complete copies of this database (or ledger) scattered around the world. Historically, companies, governments, and individuals all keep their records in one centralized database. Imagine a room with racks of computers that store information. But centralized databases can be manipulated… Records can be changed, hard drives can fail, data can be lost, and the records represent only one party’s view of any given transaction. In the world of blockchains and distributed ledger technology, the exact opposite is true. The transactions recorded on the ledger represent a transaction that takes place between the parties involved and is confirmed by the blockchain network via a consensus. Once a transaction is written to the ledger, it is immutable. It cannot be changed. The image below gives you an idea of the difference between these two network types. That last part is key. That’s because in a centralized system, we depend on “trusted” intermediaries (banks and other financial institutions) to conduct transactions. But as we’ve learned time and time again, these “trusted” intermediaries are not at all trustworthy. It wasn’t long ago when the LIBOR scandal uncovered that many of the most “trusted” financial institutions in the world were manipulating interest rates for their own benefit, and of course at the expense of others. The corruption is seemingly endless. By design, blockchain technology removes the potential for manipulation to take place. You can think of this as a “new” internet. Today’s internet is how we send pictures, stream videos and music, and send emails. 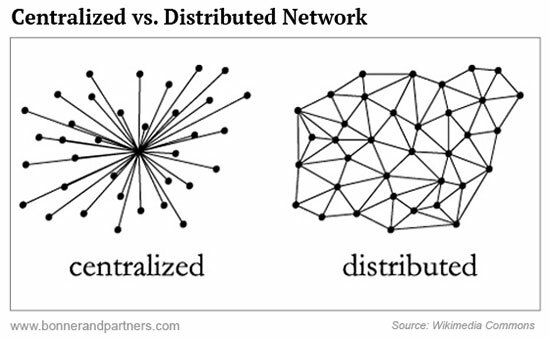 But blockchain networks are different. They are all about transferring value. The internet of value will allow you to send money, fulfill smart contracts, confirm your identity without sending sensitive information, and so much more. The way that value is transferred is typically through a blockchain’s own cryptocurrency. Each blockchain usually has a controlled, finite supply of it by design. For example, in the case of the Bitcoin blockchain, Bitcoin is its cryptocurrency… its means of transferring value and incentivizing network participants. And the Bitcoin supply is finite – only 21 million will ever be produced. Think about that… a blockchain has its own monetary policy written into its software. That’s why I’m so excited about this technology. It has the potential to rewrite our entire society the way the internet did more than 20 years ago. And the assets associated with this technology – cryptocurrency and digital tokens – will continue to soar in value. I recently came back from a blockchain conference in New York. One of the most remarkable comments made was that the “big money” (hedge funds and large money managers) isn’t really in the cryptocurrency market yet. The total cryptocurrency market sits at around $500 billion. But the institutional funds need the market to hit $1 trillion before they can start investing heavily. And when that happens… most likely sometime this year… the crypto market will really take off. And the institutional money will first put their dollars to work in the cryptocurrencies that have the largest market capitalizations. That means investors should be looking closely at Bitcoin, Ethereum, Ethereum Classic, and Bitcoin Cash, to start. There will certainly be some pullbacks and high volatility along the way, like we’re seeing today. But I’m here to tell you… now’s the time to get in.